Kamdudha Ras is herbal-mineral ayurvedic classical medicine. It is beneficial in digestive ailments, chronic fever, debility after fever or chronic disease, burning sensation, vertigo, nausea, vomiting etc. Slight amounts of titanium may also be present. Kamdudha Ras is a good natural calcium iron supplement. As compared to allopathic calcium and iron supplements, it is well tolerated and considerably safe. 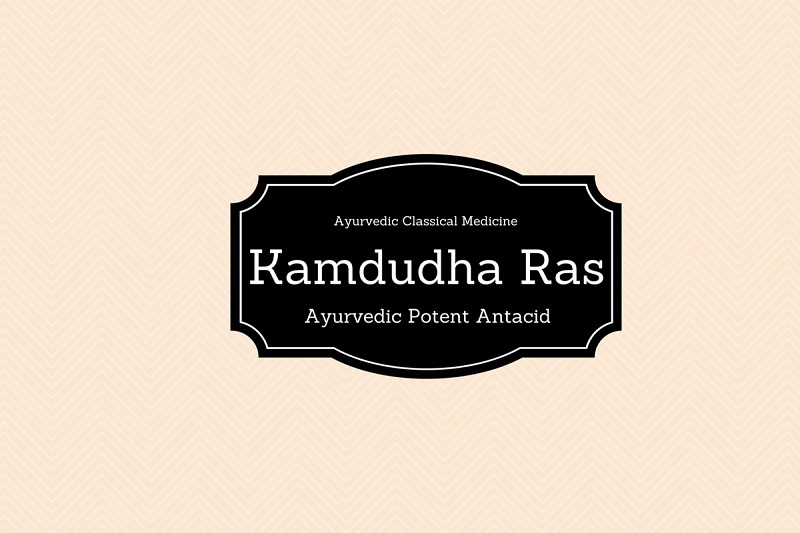 According to Ayurveda, Kamdudha Ras has effect on PITTA DOSHA. It reduces heat in the body and alleviates sensation of burning. It also neutralizes gastric acid. It reduces inflammation of gastric and esophageal mucosa. Hence, it gives relief from heartburn, hyperacidity, dyspepsia, burning sensation etc. The effect of Kamdudha Ras appears on digestive system, cardiovascular system, nervous system and urinary system. Kamdudha Ras reduces heat in the body, balances acid production in the stomach, neutralizes the excess acid, reduces inflammation of organs of digestive system, and lowers the tendency of bleeding. All ingredients in Kamdudha Ras reduces neutralizes the gastric acid and reduces symptoms of heartburn, sour taste, sour vomitus, burning sensation in the abdomen and epigastric tenderness. Kamdudha Ras is a drug of choice in both acute as well as chronic gastritis in ayurveda. It reduces inflammation of the stomach lining. It gives strength to the mucus-lined barrier in the stomach and protects the stomach lining from the damage caused by irritants like alcohol, painkillers, bacteria etc. It reduces gnawing or burning ache and nausea associated with gastritis. It is also effective for reducing feeling of fullness after eating in upper abdomen. Kamdudha Ras is effective remedy for peptic ulcer (including gastric ulcers, esophageal ulcers and duodenal ulcers). For all types of ulcer, following ayurvedic mixture is beneficial. This ayurvedic remedy heals ulcer, eradicates H. Pylori, alleviates abdominal pain and tenderness, and reduces all other symptoms of peptic ulcer. The general dosage of Kamdudha Ras is as follows. The dosage can be repeated in severe cases, but the maximum dosage of Kamdudha Ras should not exceed from 1.5 grams per day. Kamdudha Ras is considerably safe and well tolerable. The common side effect of Kamdudha Ras is constipation, but it is rarely observed. Kamdudha Ras is considerably safe for pregnant women. Ayurvedic physicians commonly use it for nausea, vomiting and morning sickness. Kamdudha Ras is considerably safe during lactation period as well. The absolute contraindications of Kamdudha Ras are hypercalcemia (elevated serum calcium level) and hemochromatosis (Iron Overload). Sir, please suggest treatment for heel pain, being an ayurvedic physician, I have a great desire to treat my patient without allopath in this case. We will release article on ayurvedic treatment of heel pain soon. Yes, Kamdudha Ras can be taken as calcium supplement. It contains high quality calcium from natural source. Which is good Kamdudha Ras Sadha or Moti Yukta? However, both are good, but Kamdudha Ras Mukta Yukta is more beneficial as compared to Kamdudha Ras Sadha. 1. How much quantity of this has to be taken in between meals? 2. Since Licorice is 30 to 40 times sweeter than sugar how can diabetic people take it? 3. Is there an alternative to licorice or can I give them the above mixture without licorice. 4. Will it still eradicate the h pylori? 5. Is there a particular brand that you suggest for the above mixtures? 1. ½ teaspoon of mixture can be taken in between meal. 2. The sweetness of Licorice is not due to sugar content. It is due to glycyrrhizin compound present in it, which does not increase blood glucose level. Secondly, carbohydrate content in 1 to 2 grams licorice is insignificant to cause elevation in glucose level in the blood. Third, some compounds in licorice also have anti-diabetic effects, according to some studies. Therefore, it can be used in diabetic patients too. 3. One can also use this mixture without Licorice if still it is required. 4. Kamdudha Ras is a main medicine, which can help to eradicate the h pylori. 5. You can prepare it at home or ask to ayurvedic store to mix it in this proportion for you. Can we take Kamdudha Ras daily? Can I take this medicine for my entire life? I have seen on internet many allopathy doctors saying such ayurvedic medicine containing metals will cause kidney problems. Let me know your views. Kamdudha Ras contains different forms of natural calcium and iron. It does not contain any heavy metal, so it can be taken on daily basis even for the entire life. I am 65 years old and still working as an Agriculture Scientist in Bangalore. During a routine blood sugar test followed by HbA1C two weeks ago, I am found to be a diabetic. I have gastric reflux problem also since last 5 years. I want to try Kamdudha Ras for this problem. Is it safe to use Kamdudha Ras for diabetics since I read in your article that one of the property is Hypoglycemic when Pitta systems in Diabetes as well as in Contraindications it is mentioned that it causes elevated levels of calcium in the serum and iron overload? Yes, Kamdudha Ras is safe for diabetic patients. It has mild Antihyperglycemic effects, which appear in diabetic patients with Pitta Dosha Dominance in symptoms, but it does not reduce blood sugar level below the normal range. So, you don’t need to worry about it. Thanks, Dr. Jagdev Singh for the reply. i have skin disease like vitiligo?is it bebeficial for me.? I have always had a number of the symptoms that you mention above under Pitta Roga, and recently started taking Praval Pishti. In general, if one wants to reduce Pitta, is it better to take Kamdudha Ras, or just Praval Pishti? Hi Sir, I have suffered from gerd issue.Can i take Kamdudha Ras ? I am CKD patient with protein leak up to 12 gms/24 hrs. With Creatnine level at 2.10, Uric Acid 7.70, calcium 8.63, phosphrous 4.28 and remaining KFT parameters within the range. Hemoglobin at 9.80. The Doctor has prescribed Chandra Prabhavati – 4 tablets a day and Kamdudha Ras Tab – 4 per day. I am afraid if these medicines would give any adverse effect on the allopathetic treatment being taken. Does these medicines contain any Metals, which are considered bad for the kidneys. Your valuable advice would be of help to me in deciding to take these medicines. No, these medicines do not contain heavy metals. However, both medicines contain small amount of iron. Dr Sahib, Is CKD a curable disease ? How long one can survive without dialysis ? CKD is diagnosed at later stages. If diagnosed at an early stage when disease just starts appearing, then a few patients can recover from this disease. However, it is not curable. Surviving without dialysis also depends on several factors. On ayurvedic medicine, some patient can only avoid dialysis for 1 to 2 years, but some patients get very good results. They don’t need dialysis for several years. It depends how your body responds to ayurvedic medicines and which medicines are you taking. Thank u Doctor Sahib for your candid observations. I have understood what is in store for patients like me. In any case my protein leak was detected in the mid of 2009. God is great ….thank you once again.